Fred Anglin took possession of the three flags that have been displayed at our ONA functions in years past. These are the American flag, the Texas State flag and the Oakhurst flag, which is the same image of the oak leaf that many of us have displayed by decal on our cars. Fred was unhappy with the poles that supported the flags, and with good reason. It seems that the “poles” were actually industrial-size mop handles and in very poor condition. Knowing that good ONA member Doug Hyde was a clever woodworker, Fred bought some sturdy 2-inch wooden dowels of appropriate length and gave them to Doug to sand, stain and finish. Finally, Fred found an American eagle to sit atop the American flagpole, a Texas five-point star for the Texas flag and NOTHING for the Oakhurst flag. At the March “Oakhurst Neighborhood Bike Ride with Mayor Betsy Price” Fred proudly displayed all three of our flags and expressed his dismay that there was no appropriate “Oakhurst finial” for our proud flag. Seeing another opportunity for self-aggrandizement, I quickly volunteered to carve a big acorn for the top of the flagpole. Using a piece of red oak from a tree in my front yard, I made a rough approximation of an acorn and completed it in time for it to be displayed at the ONA Spring General Membership Meeting. It is made from authentic Oakhurst-grown red oak. Three people took me up on the offer that night, and others expressed an interest. 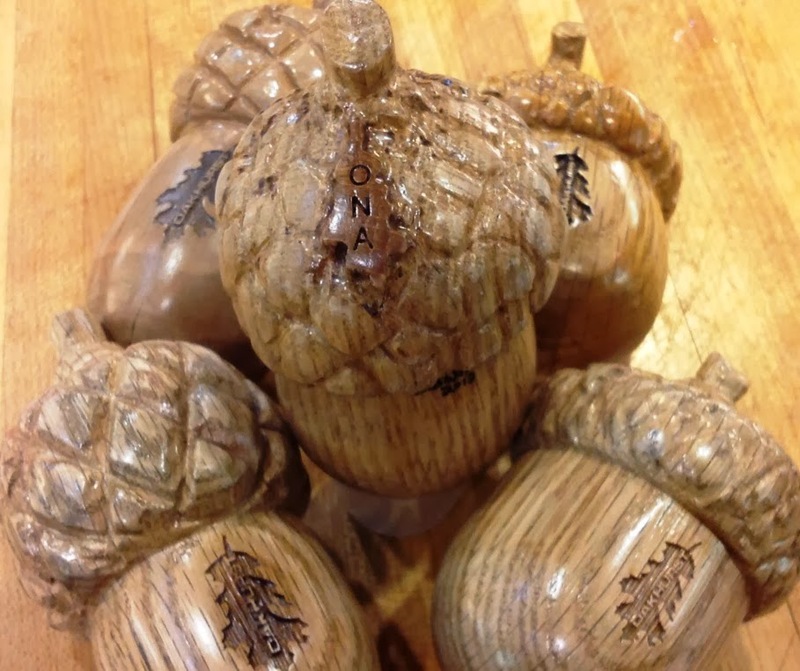 I thought, what could be easier, three more red oak acorns. What an idiot! No one carves oak! There’s a reason you make your hardwood floors and furniture out of oak. It’s hard, hard as a rock! After this experience, I’m quite confident I can carve marble or granite acorns just as easily. So, about $650 later in tools, equipment and wood, I’ve managed to finish 6 since the Spring General Meeting. Of these, Doyle Willis and Glenda Shelton have made their selections, and Ginger Bason still needs to pick hers from the remaining. They have the Oakhurst emblem laser engraved and there are three, maybe four, left. This story, authored by Dr. Glenn Calabrese, originally appeared in the November 2013 edition of the Oak Leaflet. Amanda and I just picked up our acorn from Glenn. He's personally invested more in each of these acorns than he's asking for us to donate to ONA, and he's done a great job on them. So thank you, Glenn, for your hard work on behalf of our neighborhood association!